Winter weather has taken a sudden turn for the worse in some areas of Australia. Young trees and shrubs can be more sensitive to cold and frost than more mature plants of the same species. Frost-tender young plants grown in the open without the protection of taller plants, or house eaves, are more likely to be damaged by cold. If frosts are common in your area, always position frost-tender plants where cold air can drain away. If any of your small shrubs or trees that have been planted in the open are looking decidedly unhappy, you can provide them with temporary protection from cold using a bird wire hoop that is topped with a piece of plastic, shade cloth or hessian bags at night. The cover allows warm air to be trapped around the shrub or tree. The wire hoop should be high enough to prevent foliage coming in contact with the plastic, or cold can be transferred from the plastic to the foliage. If you use clear, or a lightly coloured plastic, light and air can reach the plant, and the cover can be left over the plant until the weather warms a little. 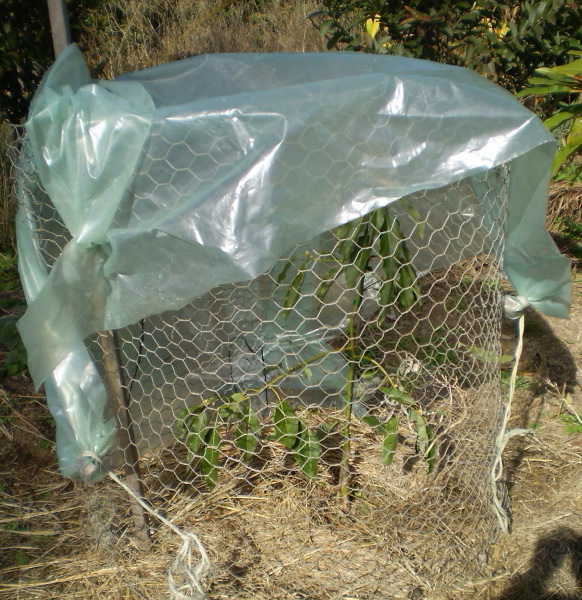 We have positioned the plastic so that our young avocado tree is also protected from cold southerly winds. A stone wrapped in each corner of the sheet prevents the twine slipping from the corners. Where severe frosts are common, and cold air does not drain away easily, you will need to cover both top and sides of the hoop at night and remove the cover mid morning. We have found that placing the cover only around the sides can trap cold air and cause water to freeze. For taller trees and shrubs that are being affected by colder than usual conditions, the poly hoops demonstrated in the post on Plant protection can be used to support a plastic or shade cloth cover. If your plants are damaged by frost, do not prune them until all danger of frost has passed, or more of the plant will be damaged by subsequent frosts. When pruning after frosts, prune during the First Quarter moon phase for more rapid regrowth. This entry was posted in Fruits and Vegetables, Ornamentals and tagged Aussie gardening, Australian gardening, cold protection, easy organic gardening, environmentally friendly gardening, frost, fruit, growing plants, Moon Planting diary, organic gardening, plants, shrubs, sustainable gardening, trees. Bookmark the permalink.